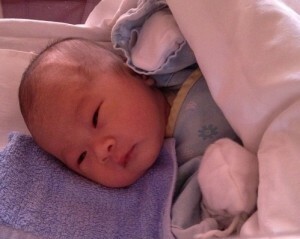 -year-old Annie Man(文頌嫻) became a proud mother of a beautiful 5-pound dragon girl! 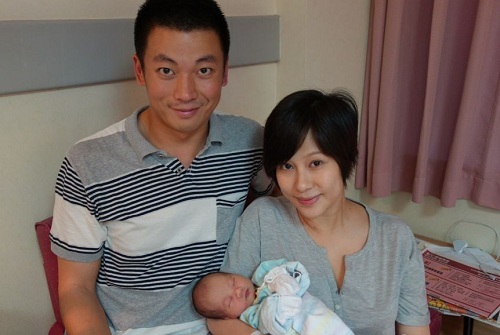 On August 20th, Annie Man gave birth by Caesarean section at the Canossa Hospital in Hong Kong. As Annie was down with a cough before delivery, her obstetrician and anaesthesiologist advised her to opt for a general anesthesia. However, Annie wanted to witness the delivery of her baby girl. Eventually, she chose a regional anesthesia during the childbirth, allowing her to remain awake and witness the miraculous moment. Annie’s husband, Jason Lee (李梓慎) was responsible for filming the childbirth process. Although Jason gazed lovingly at the baby even more than Annie, he did not forget to thank her for enduring the hardship of giving birth to their daughter. Annie’s good friend, Angela Tong (湯盈盈) also visited her yesterday. Angela, who is currently pregnant, also revealed that she had no preference whether her baby is a girl or boy. Angela shared that she had already bought a gift for Annie’s baby girl. Annie looked very cute and pretty in the above photo with (or without) little makeup. She is so cute, her cheeks makes me really want to kiss them. I remember watching Annie’s drama when I was a little kid =) Congrats to her! Read this news at another site and Congrats again to Annie and Jason!! I thought mothers only opted for C-section when they have complication during birthing and cannot give birth naturally. But, seems like a lot of stars opted for C-section by choice. I wonder why. Is it because of their age? i think they had fortune tellers picked the date. I heard that C sections don’t hurt as much as the natural way, but then again it takes more time to recover than giving natural birth. good experiences from people who’ve gone that route. But after my C-Section, I’m really scared to go under the knife again. only 4lbs and 13ozs, imagine if it was a fat baby ! Wow, I am Asian and I gave birth to my baby girl naturally – she weighted 8 lbs and 12 oz. How old is Annie? The article at beginning is cut off. Annie Man just turned 36 in July, not too late to have a child. She was born in 1976 so she is a dragon too. I wonder how old Jason is? In that case, it is good for a dragon mother to have a dragon baby! In Chinese traditions, dragon is the most powerful animal and people who are born in the year of the Dragon will have good fate and prosperity throughout their lives. for everything. Therefore, being is not always all great nor does it guarantee anything..
Annie and Jason are of the same age. Login or Register before you can reply to Rory H.
It is really silly how some Asians think that those born in the dragon year are superior, more powerful, luckier, wealthier than those born under the other 11 zodiac signs. It’s just a zodiac sign for crying out loud. So for all of us non-dragons, are we doomed for life???? Stupid is all I can say. I agree and many hold dragons at such high regard that it gets out of control. I know many non dragons that are better than those soul called dragons. Being a dragon does not guarantee anything but everyone always tries to have a dragon thinking that they ate better and superior to everyone else… They are letting Feng shui take over their minds..
Of course it is not guaranteed. If a person is superstitious, he or she will tend to believe it. Or perhaps the chance is better. i am sure annie’s baby will be as pretty as the mom. Is this the same Annie Man who act alongside Chilam in Take My Word For It? Is she the same one left TVB and go acting for ATV back then? Her acting is okay not so great…I never like her acting….Surprise I didn’t see her in the movie for a long time. Congrats to both parent! The baby is cute!!! Congrats to Annie and her husband! Beautiful baby! Another breakfast dawn example! Thought she just got married in March this year? Why like that….